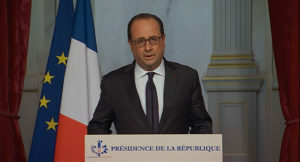 President Francois Hollande said France would “further strengthen our actions in Iraq and in Syria” after a terrorist attack in Nice killed 84 people on July 14. The terrorist who plowed a truck into a crowd celebrating Bastille Day was identified as a French citizen of Tunisian origin. French officials identified the attacker as Mohamed Lahouaiej Bouhlel. Officials said there have been no claims of responsibility, although Islamic State of Iraq and Levant (ISIL) openly celebrated the attack on social media. The Paris anti-terrorism prosecutor’s office was put in charge of the investigation. Meanwhile, family members confirmed to ABC News that two Americans were killed in the attack. Sean Copeland and his 11-year-old son Brodie, who were in Nice on a family vacation, were killed in the attack, Alyssa Weaver, the elder Copeland’s niece, wrote on Twitter. The Copelands are from Lakeway, Texas, about 30 miles west of Austin. According to the French Ministry of Health, 188 people were admitted to a hospital for their injuries. Among them, 48 are in critical condition and 25 are in intensive care. “France is strong. France will always be stronger than the fanatics who want to strike France today,” Hollande said.